Congratulations to Coach Ryan Nickell and the entire Maymont Central School girls soccer team on being presented the SHSAA / Sask Milk sportsmanship award in the 1A Girls Soccer classification for 2017. Principal Bridgette Millen emceed the school assembly recognizing the achievements of this year’s team. It is the 3rd sportsmanship award that has been presented to teams from the school. On December 13, 2018, the boys soccer team from Ahtahkakoop School were presented with the SHSAA/Sask Milk Sportsmanship Award for 1A Boys Soccer. The team competed at the provincial championship hosted by Middle Lake at the end of October. The presentation was made during a school assembly hosted by Vice-Principal, Loretta Ballantyne. Anita Medl from Sask Milk was on hand to assist with the presentation and congratulate the team and school. Coaches Isbister and Watson, along with the entire staff and school community, are very proud of the efforts of the boys and the way that the team represents the school at SHSAA events. Jack Ford from the Sask Milk Marketing Board was on hand at Yorkton Regional High School on December 21 to recognize the 3A Boys Soccer team with the Sportsmanship Award from this year’s 3A provincial championship tournament. Congratulations to Coach DeLong, the team, and the entire school community for their efforts toward sportsmanship and the ideals of school sport. The 1A Girls Volleyball Sportsmanship Award was presented to the Annaheim Rebels. The team, which is coached by Jeff Kunz, Kristen Kunz, and Karma Knittig, participated in the recent SHSAA championship hosted in Fox Valley. Parents, school staff, and school administration joined Annaheim students in congratulating the girls volleyball team on their “Blue Banner Behaviour”. Sask Milk provided milk for the event and their continued support of the SHSAA is greatly appreciated. The 1A Boys Sportsmanship Award was presented to the Medstead Mustangs. 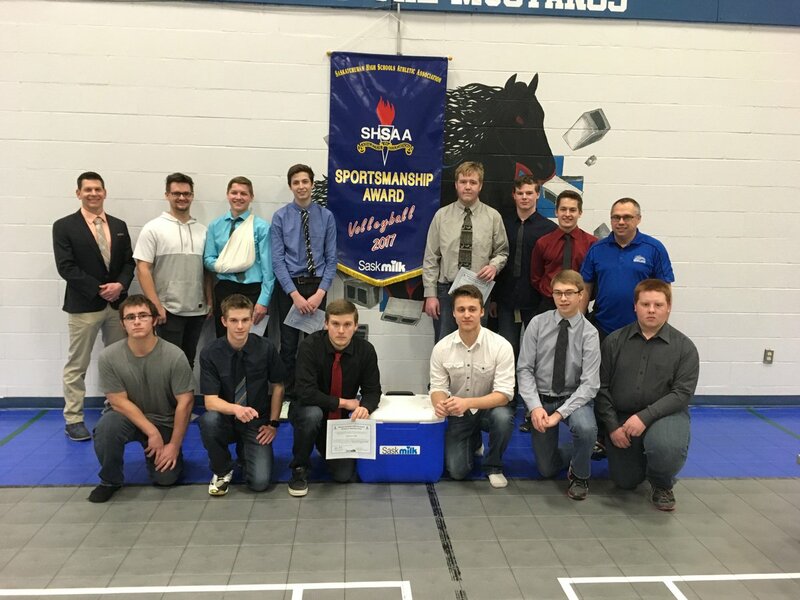 The team, which is coached by Greg Knot and Kody Rose, participated in the recent SHSAA championship hosted by Rouleau School. School staff and administration joined Medstead students in congratulating the boys volleyball team on their achievement. The 3A Girls Sportsmanship Award was presented to the Carlyle Cougars. The team, which is coached by Trent W. Johnson and Amy Jackson, participated in the recent SHSAA championship hosted by Gordon F. Kells High School in Carlyle. Parents, school staff, and school administration joined Carlyle students in congratulating the girls volleyball team on their achievement. Cornerstone Christian School in Moose Jaw was the site for the presentation of the SHSAA/Sask Milk Sportsmanship Award for 3A Boys Volleyball. The Falcons were presented with the blue banner on December 15 during a morning assembly of the student body. Lee Behrns emceed the event. As a former coach of the boys program, Mr. Behrns talked about the 20 year history of the program and the great pride that the school community has in the extra-curricular programming offered by the school. Current Coaches, Elliot and Pilon, along with the 9 students comprising the team, received individual certificates followed by the blue banner recognizing the fourth time in school history that the school has been awarded a sportsmanship banner. Thanks once again to Sask Milk for their continuing support of school sport in Saskatchewan by providing milk to the students of Cornerstone Christian School as part of the celebration. Yorkton Sacred Heart High School was the site for the presentation of the 4A Girls Volleyball Sportsmanship Award. SHSAA and Sask Milk presented the award to Coach Enns and the players during an assembly on December 21. Sask Milk Board Representative, Jack Ford, spoke of the importance of how school sport develops the skills of citizenship in the student athletes of our province. Congratulations to Principal Sterzuk and the entire school community on the award. Congratulations to Melville Comprehensive Boys Volleyball on being awarded the @shsaasport / @SaskMilk Sportsmanship Award for 4A Boys Volleyball. Thx to @SaskMilk representative Jack Ford. Congratulations to @SHHS_SRC Girls Volleyball team for being awarded the @shsaasport / @SaskMilk Sportsmanship Award for 4A Girls Volleyball. Thx to @SaskMilk representative Jack Ford for being there for today’s presentation. The Melfort Comets were presented with the SHSAA/SaskMilk sportsmanship banner for 5A Girls volleyball on Dec 21, 2017. School administration, staff, and students joined together at an assembly to recognise the efforts of the team. Congratulations to the team and coaches Jennifer South and Jerome Linnell on a successful season. A huge thank you to SaskMilk for their support of High School Athletics. The 5A Boys Sportsmanship Award was presented to the Greenall Griffins. The team, which is coached by Ken Low, Sandy Mah, Brant Bylsma, and Karen Will, competed in the recent SHSAA championship hosted in Meadow Lake. School staff and administration, the Mayor of White City, and Jessica Lovich from Sask Milk joined Greenall students in congratulating the boys volleyball team on their achievement. Sask Milk provided milk for the event; their continued support of the SHSAA is greatly appreciated.